The ancient, brooding stone protectors are brought to life with fury and flourish in this dramatic concert piece. Growling melodies are passed between all sections of the orchestra while the modal harmonies evoke ancient chants. 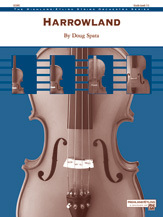 The notes and rhythms are accessible for younger students, and more advanced players can use Gargoyles to reinforce spiccato bowing techniques. This piece is sure to keep audiences on the edge of their seats!